Soak the palm peat in a bucket of water (follow instructions on the packaging) for 20-30min. 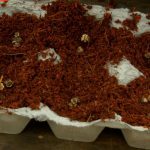 Once the palm peat is friable, simply fill the egg box to the top. Select your seed of choice and make an indent in the palm peat. 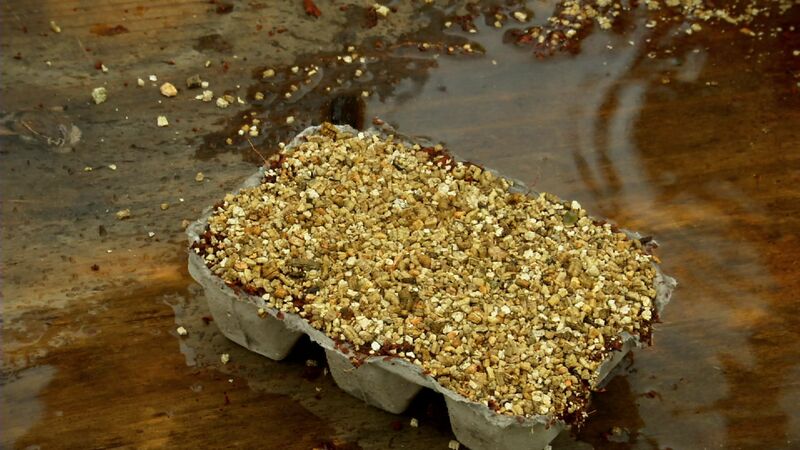 To increase the success rate of germination, go wild and add more than one seed per hole. 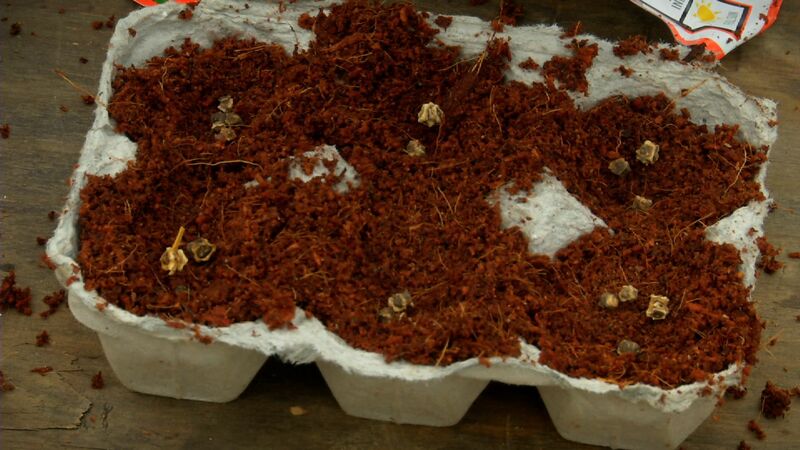 To cover the seeds, simply add a thin layer of palm peat over the seeds to tuck them in. Using the palm of your hand, simply firm the palm peat down to secure the seeds into place. 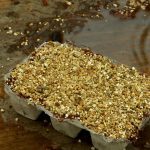 To aid in the germination process, add a layer of vermiculite. 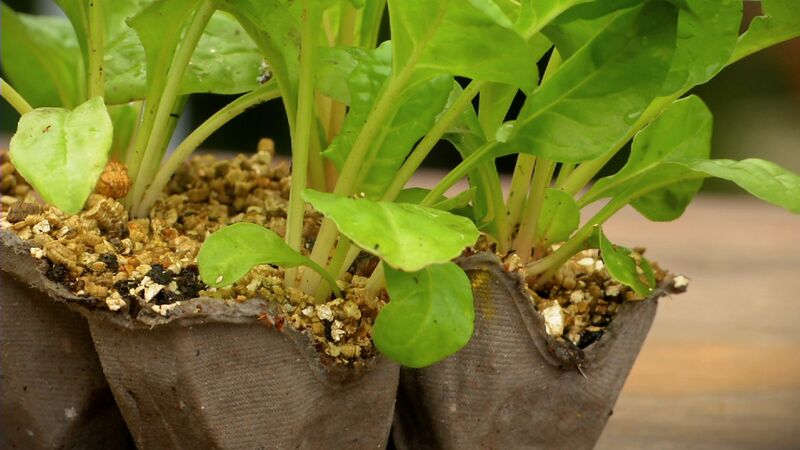 Vermiculite absorbs water and insulates the seeds. Firm down lightly again. 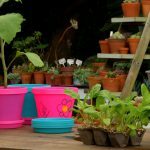 Give a light watering twice a day to ensure the seeds have enough water to germinate and grow into strong little plants. In about 12-14 days your seeds should be germinated! 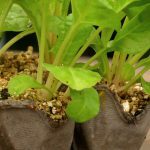 Once your seedlings are about 10-15cm high, simply pop them into a colourful pot (filled with potting soil, organic fertilizing pellets and bone meal) or into the garden (remember the compost, organic fertilizer and bone meal). 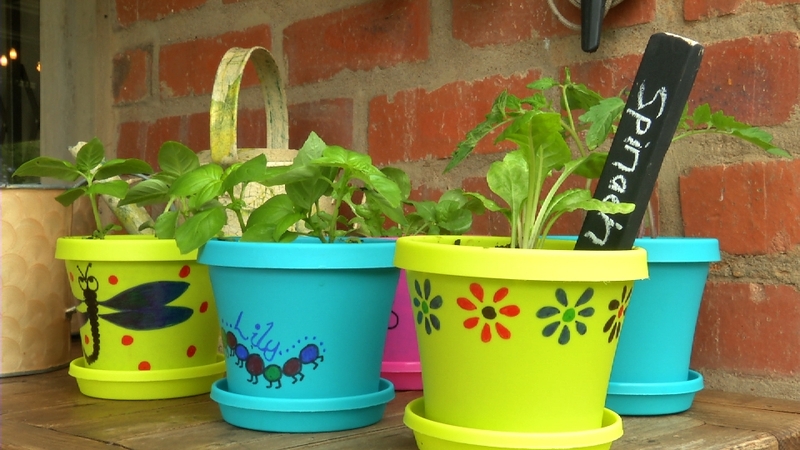 Start by painting your strips of wood with the black board paint (depending on the brand of paint you use, do ensure you read the instructions as oil based paint is not suitable for kids to work with unsupervised). Once the second coat is dry, you are ready to write on your name tag with a piece of chalk. Every child should have a see-saw and building one is easier than you might think! Your first step is cutting the tyre in half. Do this using a hacksaw or an angle grinder. Be aware of the metal reinforcement on the inside of the tyre. To measure out the size of the wooden cleat, simply measure the inside of the tyre that will attach to the cleat. Transfer the measurements to the piece of wood that will form the cleat. Using a compound mitre saw, cut the cleat to the correct length, before using a jigsaw to cut out the marked-out corners. Once the cleat has been cut to size, simply attach the cleat to the bottom of the board that makes up the “seat”. Do this by finding the centre of both pieces of wood, and lining them up. Mark our where the pilot holes will go (through the cleat) and continue to drill your pilot holes. 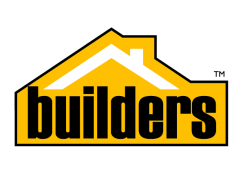 Once the pilot holes have been drilled, simply apply wood glue between the two pieces of wood and secure together using screws. To ensure there are no sharp edges, it is advisable to router the edges of the “seat” using a round-over bit. For custom wooden handles, mark out 200mm onto a piece of pine timber, then divide the wood into two 100mm sections. For the base of the handle, mark out 30mm while the arch (height) of the handle bar is 50mm. For the top of the handle, create an arch using a large lid or round form. Proceed to cut out the handles using a jigsaw. Once the first handle has been cut out, simply trace its dimensions onto the other piece of wood and continue to cut out the second handle. To fit the handles, simply place them at an equal distance apart (using the edge of the tyre is a good estimate) and secure from the side using a counter sink bit (drilled diagonally), glue and screws. Before assembling the tyre to the see-saw, paint the entire project with a universal primer (two coats) and once dried, apply the water-based enamel topcoat colour of your choice. Once the project is painted and the topcoat has dried, you can start assembling the project. Secure the tyre in place, drill pilot holes and secure using raw bolts. 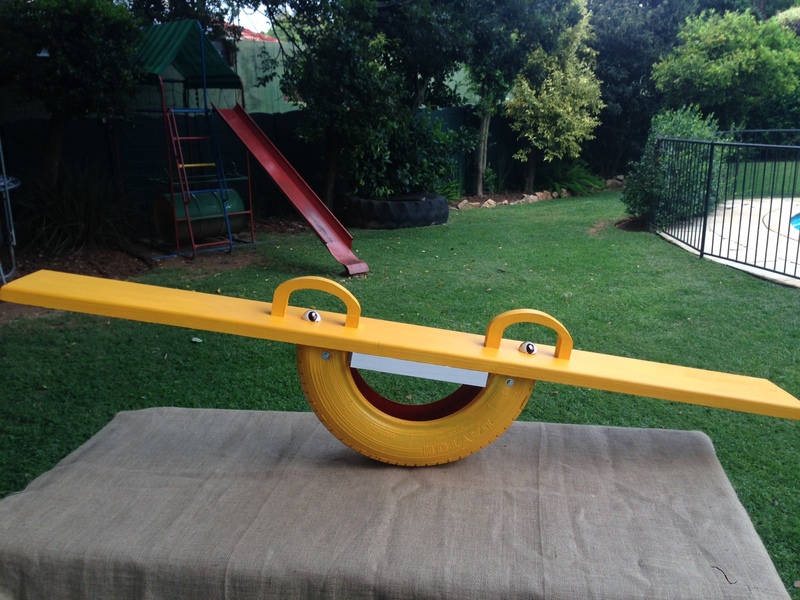 To give extra personality to your see-saw, you can add some eyes. Simply make use of a small rubber ball, cut into half, and painted to create the effect of eyes. Using clear adhesive, glue the two eye to the top of the see-saw. 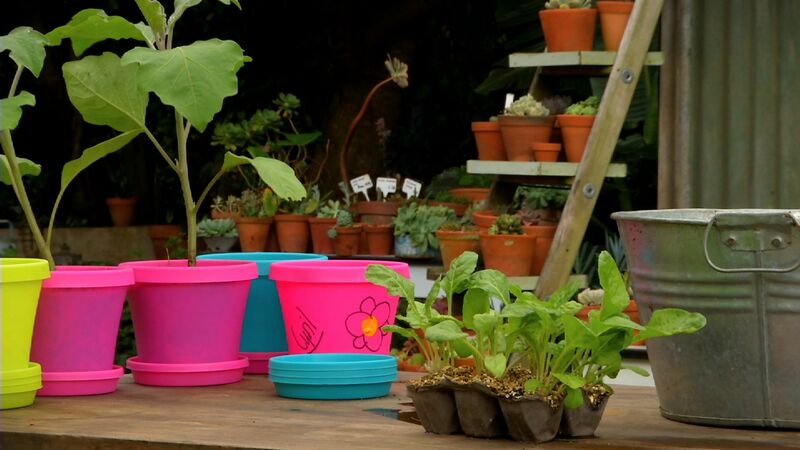 Kids room décor really allows you to have fun, by repurposing old items and experimenting with bold colours! 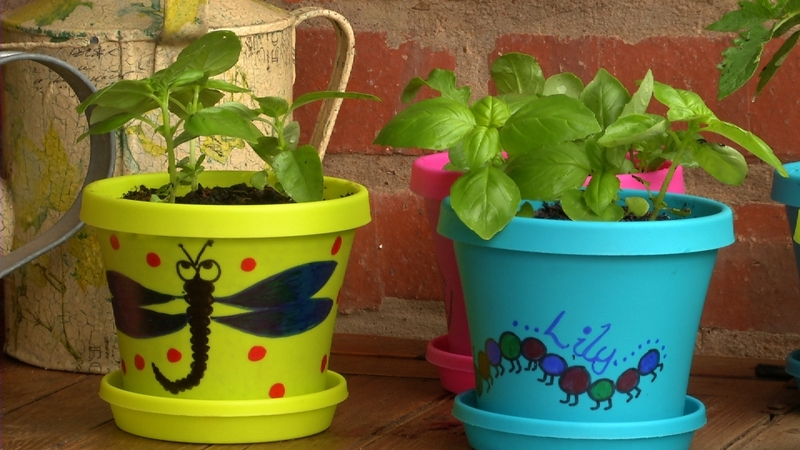 Bicycle wheels are great for repurposing or up-cycling. This kids room mobile is quick, easy and completely customisable! 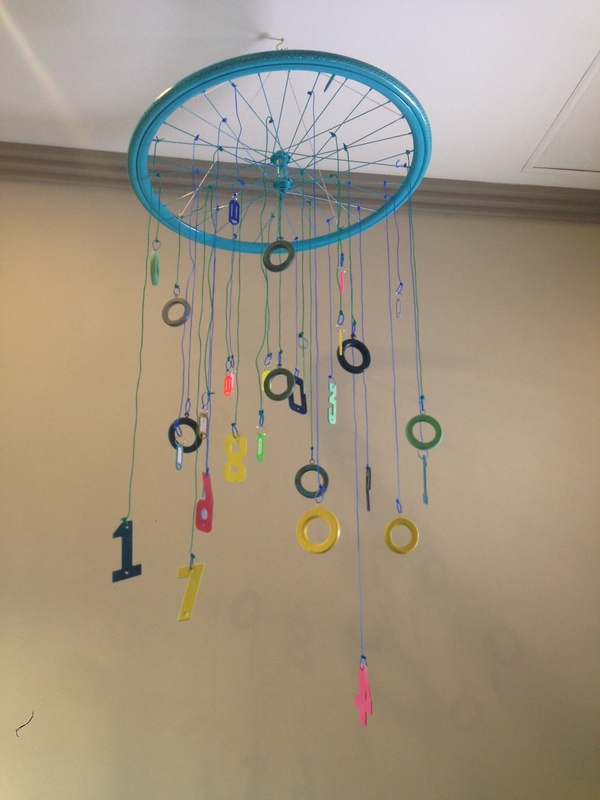 Starting with the bicycle wheel, spray paint it with the colour of your choice. Light coats are advisable and two coats should ensure a solid coverage. Remember to use a spray paint with a built-in primer for the bicycle wheel. Continue to spray paint the smaller items in different colours. Always follow the instruction on the back of the product you are using. While the spray painted items are drying, start cutting your sash cord in various lengths. This will attach your interesting hanging objects to the bicycle wheel. Once the spray painted items have dried, you can start connecting them to the sash cord. An added touch is using the coloured cable ties to the hanging objects. This adds a pop of colour while creating a space to tie the sash cord onto. 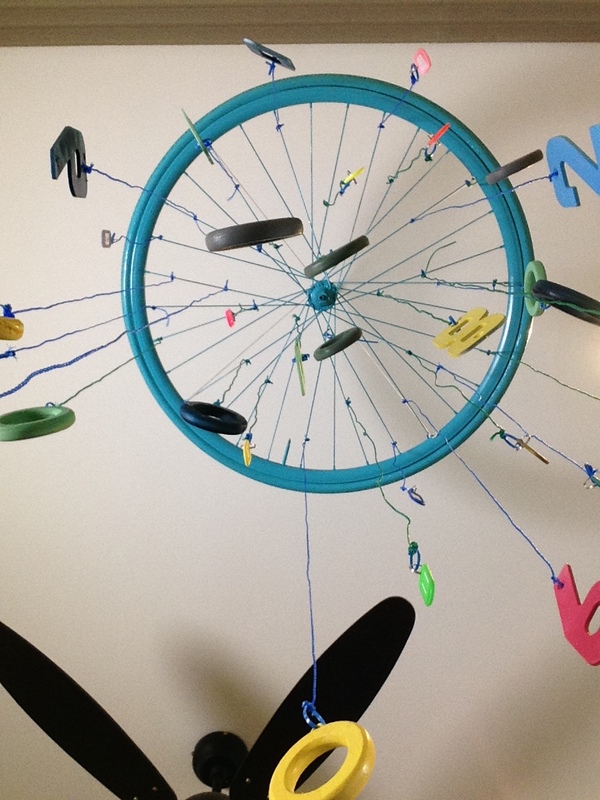 Once the paint on the bicycle wheel has dried, you can attach the hanging objects to the wheel. Have fun in arranging the hanging objects at various heights to create interest. To attach the wheel to the ceiling, tie plain cotton rope to the top of your mobile, and hang on a screw-in hook.